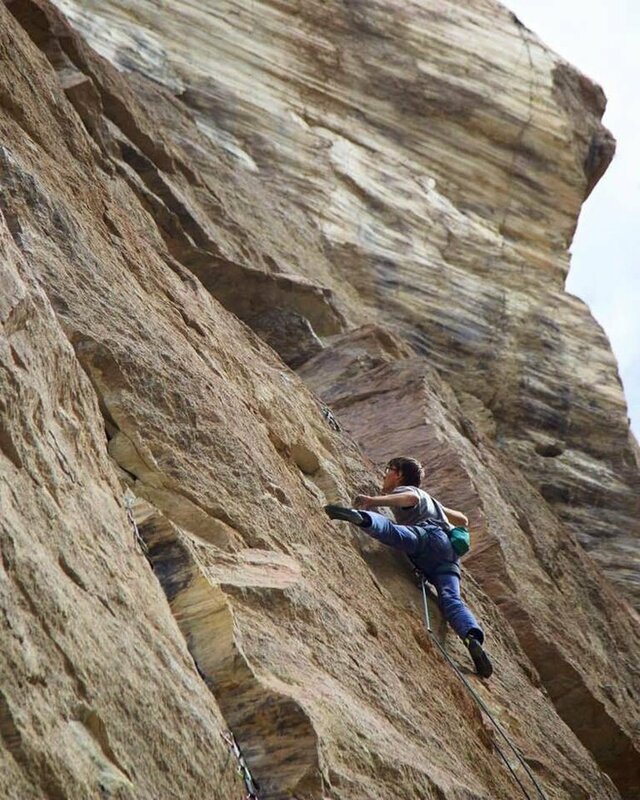 When we asked local climbing route developer Chris Hatzai to write a post for SmithRock.com on what’s been happening this past year in the Monument Area and the Marsupials, we had not realized it was the anniversary of Alex Reed’s fatal fall. Chris’s poignant piece elaborates on the route development question, expanding it into a story of evolution, both for him personally since the tragic accident, as well as an evolution for climbing at Smith Rock State Park. Hiking into the park that sunny April morning, turning right after we crossed the bridge and looking at the river, my climbing partner and I both commented on how swollen the river was. We would usually be taking the much shorter river crossing that sits at the start of the Lower Gorge, but with the short, fierce winter we all just faced, the river was too high to cross and we were forced to take the scenic route. A longer hike, but still without a care in the world, it gave Gus Wathen and I the opportunity to walk past those golden walls of tuff situated over in the Monument area. I still couldn’t help but look over to gawk at all of the work we’d put in so far, and how much more still needed to be done. Since it was currently closed due to the Golden Eagle nesting, the routes would have to wait to be worked on and wouldn’t be climbed until the summertime. On that sunny April morning however, our objective lied well past the Monument area. We were heading up to the Marsupials. Over the past fifteen months, much has changed at Smith Rock. Several new walls have been developed in the Monument area and the Marsupials area, as well as many new routes that have been established or are in the process of being established in both areas. Itʼs a dream thatʼs coming true, really. Back in 2014, when Alan Collins and I bolted our first climbing route on the Hank Wall, we envisioned that someday the wall might be as popular as some of the walls located in the main area. By the end of 2018, as the Monument area season was coming to an end, John Collins established the twelfth and final route on the Hank Wall, Mr. Scruff 12c. Having been out there the day he sent the route, it was truly a bitter-sweet experience. All the blood, sweat and tears invested into that wall came to an end that day. The final chapter was written in the Hank Wall novel and it was time to finally put that volume onto the shelf. I feel very proud to have seen that wall through to its completion, and yet, thereʼs still so much left to do at Smith Rock. Puddyʼs Tower now holds five established routes, and the rediscovery of the Big Ben formation has uncovered nine new pitches over the 2018 calendar year. Standing at the base of the Big Ben staring down towards the Hank Wall, with eyes seemingly always looking towards the future, our vision of the Monument area as a viable popular climbing area is more alive today than ever. This past fall in 2018 proved just that. Confrontation, 13b/c. Located on Brogan Spire. While swinging around on a static line on the Big Ben, with hammer and power drill swinging from both sides of my harness, I had to peer around the corner to see what all the fuss was about. Off in the distance at the base of the Hank Wall was a large group of climbers. Squinting my eyes tightly trying to make out who was climbing what, I could see several climbers on the wall—one in particular giving it their all on Tommy TwoTone (a line I had tried many many times, before squeaking out my single and only ascent of the route). Hearing those battle cries brought back some memories, let me tell you. Once I stepped back into the realm of reality from nostalgia, to my delight, I noticed many people climbing along the base of the towers Iʼve admired for years now. There were two groups at Puddyʼs Tower, a large party at the Monument, and several groups set up at the Hank Wall. As I swung back around the corner to keep working away at the new futuristic project I had dreamt up in my mind, I lowered down that day from that second pitch project with a smile firmly fixed on my face. To look back at 2018 and my experiences at Smith Rock, Iʼm left with a wide range of emotions. While feelings of happiness and accomplishment come to mind first, they are immediately followed by feelings of sadness and sorrow. While 2018 ended well for me, the beginning of that year was a different story all together. Heart of the Sunrise (Start) 12b. Located on the Big Ben Tower. At the tail end of the 2017 climbing season leading into 2018, Alex Reed was my main climbing/developing partner. Alex had just established Capacity Tenacity 12c and was hungry for more hard routes to do. The kid was climbing harder than heʼs ever climbed before and seemed to be getting very close to breaking through into that echelon grade of 5.13. As his level of mastery was excelling in climbing, his desire to establish harder routes was beginning to grow as well. Now, it has always been my experience in life to dream big or go home. Alex was one and the same in that philosophy. With that said, it was only fitting that we start to develop climbing routes on Brogan Spire located up in the Marsupials. Alex Reed bolts Bold as Love Brogan Spire's North Face. A once mythical wall of sorts, for over a decade this shaded wall held three sport routes and five aid routes (one of which was freed and is now known as Beth Roddenʼs line, The Optimist, 14b). For the first four years of living in Central Oregon and periodically climbing with Alan Collins up in his beloved Marsupials, I would always peer down at Brogan Spire while hiking up to the Dreamland wall or beyond. Hiking up the loose hillside to get to the Dreamland wall, I couldn’t help finding myself lost in a different dream about the potential lines on Brogan Spire. As it turns out, I wasn’t the only one plotting it’s development. So what happens when you get two people who dream big and put them together? They dream huge. At the beginning of 2018, Alex and I were stretching ourselves mighty thin throughout the park with our developing efforts. Alex alone, was doing an incredible amount of work in the park. He was not only helping Alan develop two brand new walls on the backside of the Marsupials (the Maiden Oregon wall and The Colosseum), but he accompanied me in the establishment of the new and highly controversial route on Picnic Lunch Wall (Sharing is Caring, 11c). During this time, he was also developing his own multi-pitch route on the Picnic Lunch Wall while continuing to scout out and pick long term projects on Brogan Spire. The ultra clean, bullet hard stone located on Brogan Spire was way above both of our heads, but we didnʼt care. Dream big or go home, remember? So thatʼs what we did. With the help of Grant Ortman, Alex, and myself, we managed to develop six of the cleanest, hard new routes at Smith Rock on that wall. Undone Open Project. Located on the Brogan Spire bolted by Alex Reed. Once the development process was finished on Brogan Spire, it was now time to start the long arduous process of trying to climb those hard routes. Being able to do none of the moves on one of the two routes I bolted, and being able to only do a third of the moves on the other, it was quite clear I had a long road ahead of me. The same was true for Alex. He was able to make about half of the moves on one of the routes he bolted, and wasnʼt able make any of the moves on the other one he developed. Thatʼs what we wanted though. Hard, long term projects that were going to help us grow as climbers and get us stronger in the process. However, all of that changed on April 10th, 2018. For as much as I would like to forget that horrible day, it is one that will live with me forever. I can still vividly remember our text conversation two days prior. I had told Alex that I was planning to be out all day on Monday, climbing at Brogan Spire. He had work later in the day on Tuesday, but was amping to get on his multi-pitch project in the morning to finish developing his route and to start working out beta on the thing. I remember telling him, and in hindsight, forever regretting not being able to get out as early as heʼd like to that day. I knew I was going to be fried from climbing all day the day before, so we agreed to meet up at 10:30am at the base of The Picnic Lunch Wall. He was going to head out a couple hours before me to hike to the top of the Misery Ridge, drop his static line down from the top of the route, and to meet me at the base of the wall. I still remember speeding down 97 because I was running a little late, driving into the park and scanning the wall looking for Alex dangling from his rope. Not seeing him or his rope hanging from the wall, I thought it a bit odd. I figured the rope was just blending in with the surroundings and expected I would see him sitting at the base waiting for me. Sadly this was not the case. After parking my car and running into the park, I stopped at the top of the hill because a park volunteer was there parked at the pavement standing next to his golf cart. I asked him if everything was ok because itʼs rare to see park staff out that early on a weekday. To my utter shock and disbelief, he replied, “No, a climber just died. Fell from The Picnic Lunch Wall.” My heart sank. I immediately looked down to the base of the wall and saw two men in black suits surrounding what I knew was Alexʼs body. Half in shock, half in extreme grief, I turned around and walked back to the parking lot. I sat down on the ground and leaned against my car. Hysterically crying, the first person I thought to call was my sister, Alyse. Unsure of what to do, and fighting with the option of running down to see Alexʼs body, I hopped back into my car and took her of advice of “just go home”. The rest of that day felt like a bad dream. Driving back to town, the first place I went to was Metolius. I sat down in my bossʼ chair in his office and started to cry. I remember sitting in Kentʼs office for an hour or two and then decided to head to the Bend Rock Gym to let his family of co-workers know what tragic event had just taken place. After leaving the rock gym, it was beginning into the evening time and Alan still didnʼt know Alex had died that morning. I drove back out to Smith, hiked up to the Marsupials and found Alan down by the Maiden Oregon Wall. After delivering the devastating news, we sat and cried together for some time. Sitting there together in our much needed cypher, a strong gust of wind came blowing through; we both knew Alex was right there with us at that moment, getting high for one last time. That day and the days preceding Alexʼs death were some of the hardest times of my life. Had it not been for the love and support this community has shown, I donʼt know if I would have ever made it through those desperate times. After Alexʼs death, it was very clear and apparent I needed to honor his legacy and do what we knew best, go climbing. Plans of setting those lofty goals on Brogan Spire suddenly shifted to getting those amazing routes established as quickly as possible for everyone to enjoy. There was no better and fitting way of achieving that goal than having Alan send almost every hard route on that wall. It was an honor just to have been a part of the developing process on that pristine piece of rock, and for that I feel eternally grateful: Grateful for having known and been friends with Alex. Grateful for climbing with Alan again. Grateful for being a part of this amazing community. And grateful for climbing. After our nice forty-five minute hike up to Brogan Spire, Gus was immediately admiring the wall and asking the name and grade of each route set before him. Starting from the far left side of the crag and going through the twenty routes that now rest on the Brogan Spire, we decided to warm up on a fun 10d on the far right side of the wall, Are You Experienced. To the left of that, we then hopped on a stout 11d named Charcoal Fighter. After our fun overhung warmups, it was time for the business. We hiked up to the amphitheater section of the crag on the far left side of the wall. Gus tried a new 12a named Ambush in the Night and I gave two goes on my project, Redemption, 12d. I walked away with two more “one hangs” that day. Feeling complete and satisfied, we hiked down Burma Road admiring the amazing view looking out over Smith Rock with a great panorama of the Cascades in the background. Hiking through the park back to the car, we talked about life, training regiments and future plans for climbing. Redemption 12d, Located on Brogan Spire. Tananger Tananger on Ambush in the Night, 12a. Located on Brogan Spire. I sit here now and ask myself, what will 2019 bring at Smith Rock? While Iʼm sure there will be many more new routes that get developed, hopefully this year is the year Iʼll be able to actually climb some of them! Regardless of the outcome, I do know Iʼll be having a blast just simply working through the process of it all. So far, 2019 has been really good to me at Smith. Spirits are high, but weʼll just have wait and see what else the future holds in store....Hopefully sending more routes.